Power: 58 Watts Codename: ? The Apple I, also known as the Apple-1, was an early personal computer. They were designed and hand-built by Steve Wozniak. Wozniak’s friend Steve Jobs had the idea of selling the computer. The Apple I was Apple’s first product, demonstrated in April 1976 at the Homebrew Computer Club in Palo Alto, California. It went on sale in July 1976 at a price of $666.66, because Wozniak liked repeating digits and because they originally sold it to a local shop for $500 and added a one-third markup. About 200 units were produced. Unlike other hobbyist computers of its day, which were sold as kits, the Apple I was a fully assembled circuit board containing about 30 chips. However, to make a working computer, users still had to add a case, power supply, keyboard, and display. An optional board providing a cassette interface for storage was later released at a cost of $75. The Apple I is sometimes credited as the first personal computer to be sold in fully assembled form; however, some argue that the honor rightfully belongs to other machines, such as the MOS Technology KIM-1, Datapoint 2200, or more commonly the Altair 8800 (which could be bought in kit or assembled form at extra cost). 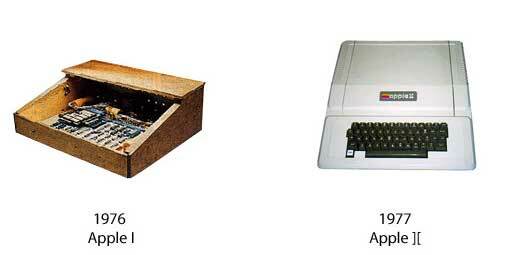 One major difference sets the Apple I apart — it was the first personal computer to use a keyboard. The Apple I’s built-in computer terminal circuitry was distinctive. All one needed was a keyboard and an inexpensive video monitor. Competing machines such as the Altair 8800 generally were programmed with front-mounted toggle switches and used indicator lights (red LEDs, most commonly) for output, and had to be extended with separate hardware to allow connection to a computer terminal or a teletype machine. This made the Apple I an innovative machine for its day. In April 1977 the price was dropped to $475.. It continued to be sold through August 1977, despite the introduction of the Apple II in April 1977, which began shipping in June of that year. The Apple II was otherwise identical to the Apple I, except it added more RAM, color graphics, sound capabilities, additional expansion slots and was notably contained in a styled plastic case with an integrated keyboard. 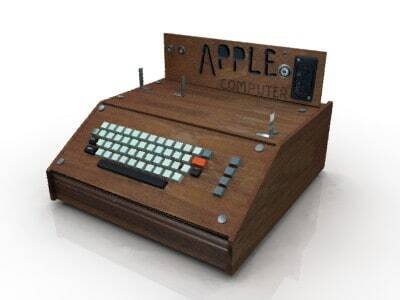 Apple had dropped the Apple 1 from its price list by October 1977, officially discontinuing it. As of 2008, an estimated 30 to 50 Apple Is are still known to exist, making it a very rare collector’s item. An Apple I reportedly sold for $50,000 at auction in 1999; however, a more typical price for an Apple I is in the $14,000–$16,000 range. A software-compatible clone of the Apple I (Replica 1) produced using modern components, was released in 2003 at a price of around $200. The Apple II (often written as Apple ][ or Apple //) was the first mass produced microcomputer product, manufactured by Apple Computer (now Apple Inc.). It was among the first home computers on the market, and became one of the most recognizable and successful. In terms of ease of use, features and expandability the Apple II was a major technological advancement over its predecessor, the Apple I, a limited production bare circuit board computer for electronics hobbyists which pioneered many features that made the Apple II a commercial success. Introduced at the West Coast Computer Faire in 1977, the Apple II was among the first successful personal computers and responsible for launching the Apple company into a successful business. Throughout the years a number of different models were introduced and sold, with the most popular model manufactured having relatively minor changes even into the 1990s. By the end of its production in 1993, somewhere between five and six million Apple II series computers (including approximately 1.25 million Apple IIGS models) had been produced. Throughout the 1980s and much of the 1990s, the Apple II was the de facto standard computer in American education; some of them are still operational in classrooms today. The Apple II was popular with business users as well as with families and schools, particularly after the release of the popular spreadsheet, VisiCalc, which initially ran only on the Apple II. The original Apple II operating system was only the built-in BASIC interpreter contained in ROM. Apple DOS was added to support the diskette drive; the last version was “Apple DOS 3.3”. Apple DOS was superseded by ProDOS to support a hierarchical filesystem and larger storage devices. With an optional Z80 based expansion card the Apple II could even run the popular Wordstar and dBase software under the CP/M operating system. At the height of its evolution, towards the late 1980s, the platform had the graphical look of a hybrid of the Apple II and Macintosh with the introduction of the Apple IIGS. By 1992, the platform featured 16-bit processing capabilities, a mouse driven Graphical User Interface and graphic and sound capabilities far beyond the original. After years of focus on Apple’s Macintosh product line, it finally eclipsed the Apple II series in the early 1990s. Even after the introduction of the Macintosh, the Apple II had remained Apple’s primary revenue source for years: the Apple II and its associated community of third-party developers and retailers were once a billion-dollar-a-year industry. The Apple IIGS model was sold through to the end of 1992. The Apple IIe model was removed from the product line on October 15, 1993, ending an era. Just saying, the apple II had a cassete library. It was just very small. The first Apple II’s were just like the Apple I. The first batch were just sold as a board only. They then offered cases without vents. There were only 200 ventless Apple II’s produced. The cases warped from the heat. So, if you’re considering the Apple II in 1977, you should either show the board only, or the ventless Apple II.